This recipe is from www.whfoods.org. It is absolutely delicious and only uses 4 ingredients. Combine walnuts and pitted dates in a food processor. Process until well mixed and ground, but not smooth (about 40 seconds- it should be a course texture when done). Press into a 9 inch tart pan. Set in fridge while making filling. Place 2 c. of the berries along with cornstarch and water (or juice) in a blender. Place in a small saucepan along with honey and cook puree over medium heat, stirring constantly for about 3-4 minutes. It should lose its cloudiness and thicken. When it thickens and the cloudiness is gone, remove from heat. 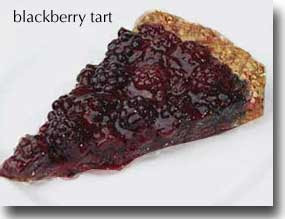 Mix with the rest of the blackberries and fill tart shell. Refrigerate for at least 3 hours. Make sure it's covered so it doesn't pick up moisture from the refrigerator. *If you are using frozen berries, make sure they are completely thawed. If not, they will dilute the filling and make it runny. You may need to process crust in 2 batches so it doesn't get too smooth (you should not process more than 40 seconds for each batch). If it's over processed the crust will end up pasty, if it's not quite ground enough it won't hold together. *One serving (it serves 8) gives about 120% of your daily value for Omega 3 fatty acids. It is also very high in manganese, copper, fiber, and vitamin C and has tons of antioxidants!